Overwatch has seen a 40% reduction in “disruptive behaviour” since the introduction of a new positive reward system. Blizzard research scientist Natasha Miller told an audience at GDC yesterday (via PC Games Insider) of how the developer has begun to deter “disruptive behaviour” through a promotion of positive interaction. Blizzard added the ‘endorsement system’ to Overwatch last June. It allows players to leave a positive review of their teammates in two categories – one for leadership and strategy, and another for helpfulness and effective communication. Players also have the option to endorse their rivals for good sportsmanship in-game, presumably to deter spawn-killers and the like from resorting to cheap tactics. The system then tracks these endorsements, allowing players to rank up their endorsement level, which in turn can be used to earn Loot Boxes. This cleverly works as a deterrent, too: Players risk losing levels should they stop receiving endorsements, or by leaving games early (which most of us call rage-quitting). Players who reach higher levels of the endorsement system are grouped with other highly endorsed players during matchmaking, in a bid to ensure the amicable elite continue to play together on the nicest possible terms. It does put me a bit in the mind of that one Black Mirror episode, but from Miller’s talk, the social ranking system seems to be effective in this case. 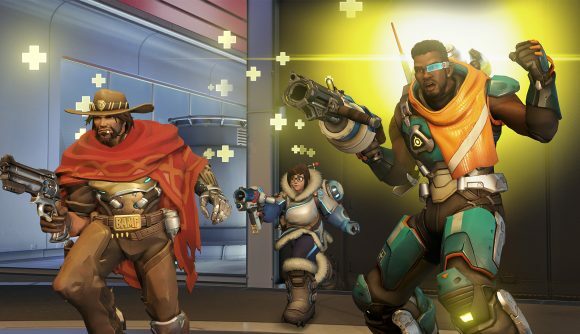 Last July, Overwatch’s director took to the game’s forums to reveal that only one month after implementation, the endorsement system had encouraged a 26.4% decrease in competitive matches that contained abusive chat. It’s good to see that the trend is continuing, as it would be nice to play Mercy without someone swearing at me simply for healing a teammate. If you’re new to Overwatch, check out our guide Overwatch ranks explained. Overwatch’s ranking system works differently to a lot of other PC games.